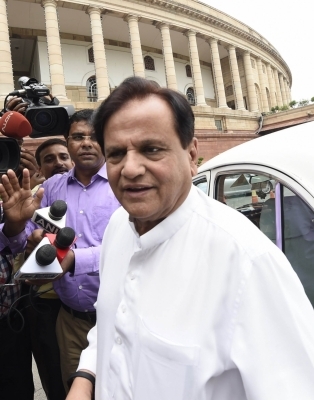 New Delhi, Oct 28 (IANS) The Janata Dal-United faction led by Bihar Chief Minister Nitish Kumar on Saturday demanded a “free and fair probe” into allegations that Congress leader Ahmed Patel had links with two arrested terrorists in Gujarat. “The allegations against Ahmed Patel has been made by the Chief Minister of the state, which are very serious in nature. So we demand a free and fair probe,” JD-U spokesperson K.C. Tyagi told reporters here. He also said that and if anyone’s “role is established then the law must act”. “On the issue of national security we are very straight that there will be no compromise with it. Let the law take its own course. If anyone is found guilty then he should be punished,” Tyagi said. Tyagi’s remarks came a day after Gujarat Chief Minister Vijay Rupani alleged that Patel was linked to a suspected terrorist arrested by the state’s Anti-Terrorist Squad on Wednesday from Bharuch. Patel has rubbished the charge. Rupani told reporters that Mohammed Qasim Stimberwala, caught by the Intelligence Bureau and security agencies, was working at a Bharuch hospital where Patel had been a trustee and, though he resigned after the UPA lost power “still oversees the working of the hospital”. Stimberwala, one of the two alleged IS operatives arrested by the Gujarat ATS from Surat, had resigned recently as an echocardiogram technician in the Sardar Patel Hospital and Heart Institute in Ankleshwar, which Patel had helped grow into a modern facility. Patel was one of the trustees during the hospital’s formative years as a modern hospital and the only one in the entire Bharuch district with latest equipment and technology with facilities for heart surgery. He had resigned as a trustee in 2014, facilitating a new board of trustees to take over. The ATS, which picked up Stimberwala and Ubed Ahmed Mirza, claimed that the two were planning to attack a Jewish synagogue in Khadia area of Ahmedabad and had even carried out reconnaissance of their target. Mirza was a practicing lawyer at the Surat district court, Stimberwala worked as a technician at the Ankleshwar hospital.